When I first decided on my yarn projects for October, I picked the Ghost Coasters found on the Red Heart site, designed by Kara Gunza of Petals to Picots. 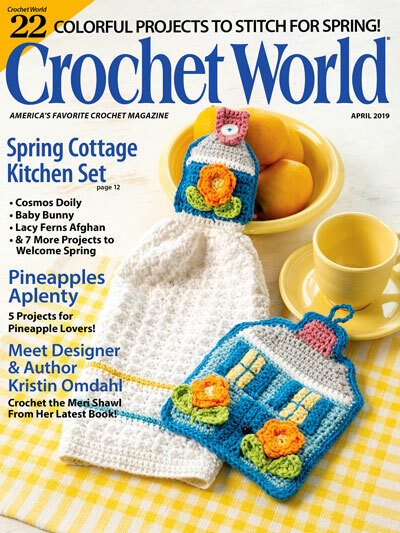 I have loved this fun design since it first was published, and only took me a couple years to get around to it. Since working them up, I think they make better appliques than coasters. Read on to find out more. Before I go on, I worked the cat and “boo” up in plastic canvas and some Red Heart Super Saver that was in my stash. It’s a magnet that has a home on my fridge for Halloween – the only Halloween decoration you’ll find up this year. I worked this up several years ago, and don’t remember what pattern I used for it, but I thought it would be a great addition to my ghosts for the picture. 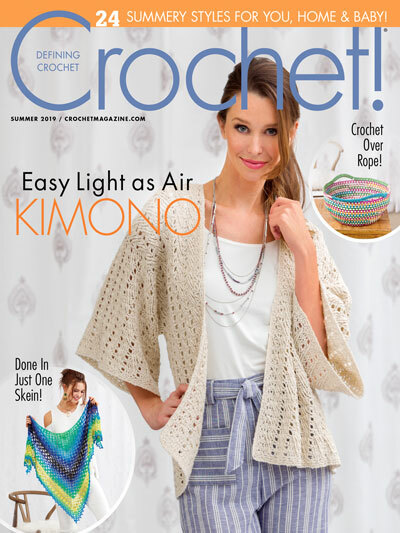 Original design is worked in Red Heart’s Super Saver Yarn. I finished my ghosts in about just under half an hour each. This pattern was very easy to follow, and the design was quick to work up. The only thing I found was in the border. If you look at my two ghosts, you will notice they mirror each other. For the worsted weight version, I did turn before starting the border, and for the thread version, I did not turn as instructed. By not turning, it created a small gap at my bottom point. I think it finishes up better if turned. If you are making a set, just work them all the same so they finish the same direction. When adding the chains for the arms, I recommend working the stitches into the back bumps of the chain, rather than just into the chain. This will give the arms a clean, straight edge, and clearer stitches to work the border into, which will prevent any gaps here, as opposed to just working on the opposite site of the foundation chain. I also recommend when working the border at the points where the body and arms meet, as well as, where the arms and neck meet, to pay more attention to where you place your stitches. If too many are placed here, these areas will bunch. I skipped the eye embroidery, but if the embroidery intimidates you, you could also cut out and stitch on or glue some felt pieces, use fabric paint to draw the face on, or even attach some small pom poms for the eyes. Because the ghost does not lay flat at the arms and head, I feel like it would be better used as an applique where all the points will be tacked down. 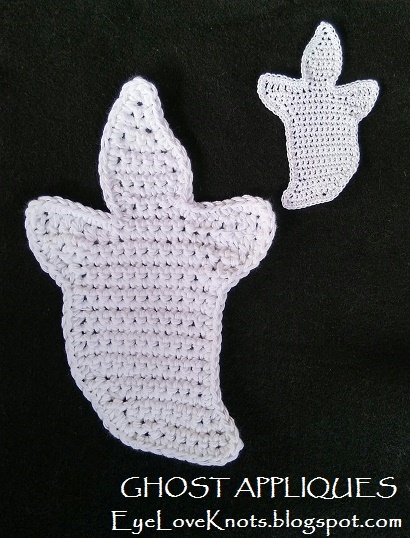 Using different weight yarns produces different sized ghosts, which could be used for a large variety of projects. I think the thread weight ghost would be great to embellish with like on a card, hat, afghan square, or shirt pocket, and the worsted weight version would be great to embellish with like on a pillow, afghan, rug, or used to create an art piece. You could also block either size, and string several up to make a garland. 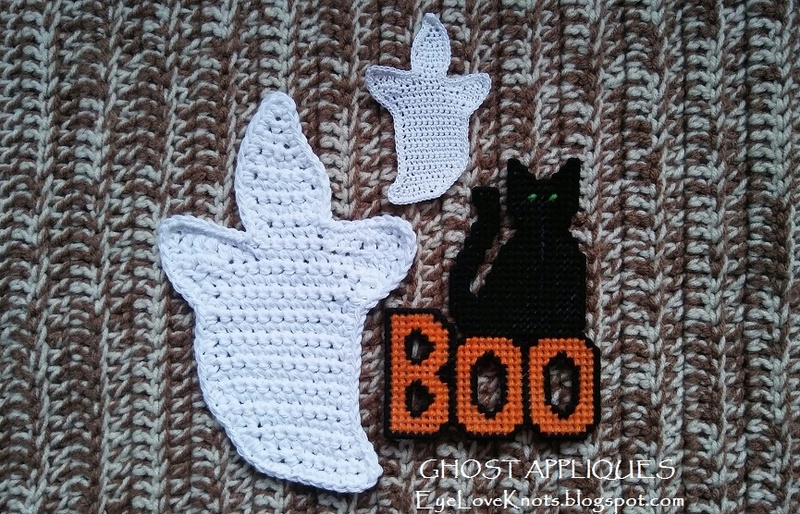 If you are feeling up for a challenge, you could use sewing thread and block, and turn the ghosts into a pair of earrings, or use as a necklace pendant. Overall, I think this is a great pattern – easy to read, and quick to work up, and can be used in some many ways. I will be saving my ideas for next year, but if you would like to see anything specifically, feel free to drop me a line. 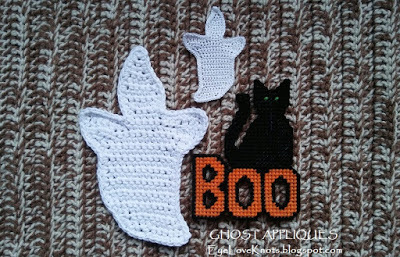 Don’t Crochet but Interested in Purchasing a Ghost Applique? Visit the EyeLoveKnots Etsy Shop to see what I have available! Use the search box to type in what you have in mind, or feel free to send me a message with your custom request. I am happy to make in any custom size and/or color. So cute! 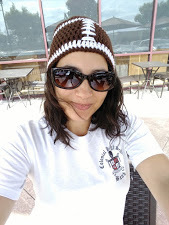 And thanks for linking up at Friday Frenzy Link Party! I hope you link up again next week 🙂 PINNED! These are adorable and just the right kind of spooky! Thanks for sharing at Snickerdoodle. Pinning. These would be cute on many things, including your candy corn bags! Thank you for sharing with us at Designing You!